These galaxy clusters are representative of more than 80 clusters that were used to track the effects of dark energy on these massive objects over time. Most of the matter in galaxy clusters is in the form of very hot gas, which emits copious amounts of X-rays. Billions of years ago, theuniverse was crowded with tight-knit clusters of galaxies. Then, a partycrasher got the upper hand. This mysterious force now called dark energy hassince been expanding the universe at an increasing pace. New measurements of this acceleratingexpansion, which drives galaxies away from one another on large scales butso far shows no effects on small scales (such as within a galaxy), providedetails about the nature of the unseen and unknown dark energy that is at work. The results, announced todayat a news conference organized by NASA, reveal a decrease in the mass of galaxyclusters in more recent times, which would be a consequence of this hasteningand ripping force that some think could eventuallytear apart even star systems, planets and eventually the very moleculeswe're made of. "If there were any doubts10 years after the initial discovery that the universe was speeding up, thisshould really dispel them," said Michael Turner of the University of Chicago's Department of Astronomy and Astrophysics, who was not involved in thecurrent study. In addition, the new results,which relied on the Chandra X-ray Observatory, suggest darkenergy takes the form of what Einstein called the cosmological constant ? aterm in Einstein's general relativity that represents the possibility of emptyspace having a density and pressure associated with it. If darkenergy is indeed some kind of repulsive force that is linked with"nothing," and the density of dark energy stays the same over time,astrophysicists say the expansion of the universe will continue to speed up. Sorather than galaxies mingling and merging, they will fly away from one another. Andbillions of years from now, the scientists say, local superclusters of galaxieswill also disintegrate and all other galaxies will ultimately disappear fromthe Milky Way's view. "Wedon't really have a clue why the universe is speeding up. We have some ideas,but we really don't understand it," said Turner, who is credited withcoming up with the term "dark energy." "And so having yetanother method to study how that speed-up happened can only help us, can onlymake us more optimistic about eventually understanding what the dark energyis." Dark energy was discovered in1998 by two teams of astronomers, who measured light coming from explodingstars called Type IA supernovae, known as "standard candles" fortheir consistent brightness. The striking result was that distant supernovaewere dimmer (farther away) than they would be in a universe that was slowingdown. The result suggested the expansion of the universe was accelerating. Andthe teams proposed something called dark energy could be driving thisacceleration. This acceleration, it is thought, began about 5 billion yearsago. That was the first stand-aloneevidence to support the idea of darkenergy. And whereas then the repulsive force could have been brushed off as the result of possible errors in the measurements, more and more independent detections have solidified dark energy's existence. Astronomers estimate now thatout of the total mass-energy budget in the universe, about 74 to 76 percent isdark energy, 20 to 22 percent is dark matter and 4 percent or so is normalmatter that makes stars, planets and everything we see. And they know that some"force" is causing galaxies to fly away from one another, operatinglike antigravity. Rather than using Type IA supernovae, the new study is based on observations of clusters of galaxies atdifferent time points in the history of the universe. Scientists say the newstudy marks the second stand-alone evidence for the existence of dark energy.? "This is surely the bestjob that anyone has been able to do so far in using clusters to measure how theuniverse has gotten clumpy over time," said Robert Kirshner of the Harvard-Smithsonian Center for Astrophysics in Massachusetts. Kirshner, who was not involved inthe current study, was on one of the teams that first discovered dark energy. A team led by Alexey Vikhlininof the Smithsonian Astrophysical Observatory in Cambridge, Mass., used theChandra X-ray Observatory to measure the hot gas in dozens of galaxy clusters,which are the largest collapsed objects in the universe. Some of these clusters arerelatively nearby and others are more than halfway across the universe.Basically, the team was looking at X-rays emitted from this hot gas as it fellinto areas chock-fullof dark matter, or the mysterious material thought to act as scaffoldingonto which galaxies mature. 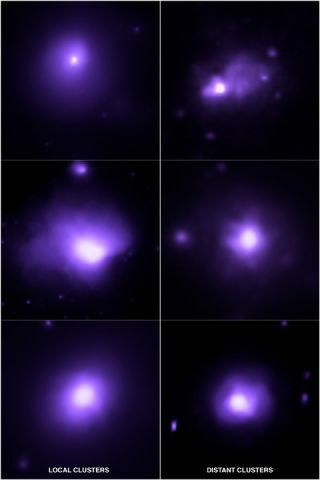 The X-rays can be converted into mass for a givencluster at a given point in time (depending on the age of the cluster). "It's like there's atug-of-war going on between the dark matter trying to slow things down andclump things and the dark energy trying to speed things up and eventuallymaking it hard for the galaxies or the dark matter to cluster," Kirshnertold SPACE.com. When astronomers look fartheracross the cosmos, they are looking back in time. And in fact, the results showan increase in the mass of the galaxy clusters further back in time,which supports the idea that dark energy started to win out in the tug of warat some point in the universe's history. Astronomers are not certain on thetiming of the change from an expanding universe to one whose expansion isspeeding up. With dark energy taking over,it would be more difficult for objects such as galaxies to get together andform clusters as space is being stretched. So astronomers would expect to see aslowdown of the growth of galaxy clusters in a dark-energy-dominated universe. "This result could bedescribed as 'arrested development of the universe'," Vikhlinin said. "Whatever is forcing the expansion of the universe to speed up is alsoforcing its development to slow down." While the new galaxy-clusterresults strengthen the case for an accelerating universe, scientists have along trek before cracking the case of what dark energy is. "I don't see us solvingthis in two or three years. We're going to have to bring to bear lots ofdifferent techniques to figure out what dark energy is," Turner saidduring a telephone interview. "This is a very big puzzle. This may be themost profound problem in all of science." Scientists can continue tostudy the clustering of galaxies over time. Further study could show darkenergy doesn't take the form of the cosmological constant. For instance,another idea is that general relativity falls apart on larger scales. And perhaps dark energy isstirring up trouble in another way, not just speeding up the expansion of theuniverse. "One of the areas where we think we might get really lucky isthat maybe there will be some other manifestation [of dark energy], but wedon't have any yet," Turner said. "And there's so much of this stuffin the universe it's hard to believe there isn't another manifestation. Butright now the only thing we know that dark energy is doing is causing theuniverse to speed up."